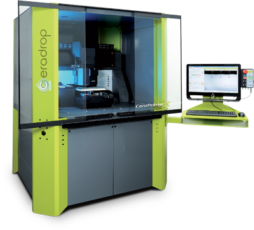 CERADROP has provided such a prestigious Institution with its Advanced Modular-based CeraPrinter Equipment, offering an exclusive solution for the most challenging R&D projects. CERADROP expertise is focused on design and manufacturing of an innovative and versatile systems for Printed Electronics and Smart 3D Printing. We are proud to provide such the world famous actors with all-in-one Solution for Nanotechnologies implementation. “From its inception 13 years ago, the INT thinks that Vietnam needs to acquire knowledge and know-how in microfabrication. Among those technologies, inkjet printing is a recognized contender with many research activities underway. The interest of CeraPrinter X-Serie is that the building blocks for such multilayer flex are modular-based and it provides the flexibility to print the circuit exactly as desired while providing a tight control on the different layer thicknesses. – noted Prof. DANG Mau Chien, Director of the Institute for Nanotechnology (INT), Vietnam National University – Ho Chi Minh City (VNUHCM).